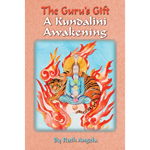 I had a Kundalini Awakening in 1979 and have written about this strange experience for the benefit of others who may also be experiencing this phenomena without any idea what it is. The experience dominated my awareness and life for almost two years then, and it has taken me 20 years of research to understand the amazing gift I had been given. At first I just wanted to figure out what had happened, as it was so alarming and disruptive to my Yuppie life. Almost no one in America knew what was going on with me except my guru. So I set out in 1993 to find out what occurs when the Kundalini is released from its coil at the base of the spine. How does it change a person? What does it do as it cleanses? Where does it go? What kinds of outcomes can one expect? When does the process end? And, Why me? I offer this report with a full index, so that it might yield some benefit to others. When I received this gift, the value was not apparent to me in 1979, but today after learning so much more, I am unable to express the full extent of my gratitude. I offer this small token of what I have discovered to you, to spread the news, to transmit the wonder of what it truly is to be a human being. This is “The Guru’s Gift” that is our human birthright, and which opens up the heart to the truth of what a human being can be.